Well you don’t need to book a trip to an exotic spa or meditation center to get the peace you crave. In fact, your private retreat could be as close as your own backyard in your very own She Shed. Also known as Femme dens, lady lounges, or lady lairs, She Sheds are the modern woman’s answer to the Man Cave. Women across the country are turning ordinary backyard sheds into private spaces where they can relax, take time for themselves, engage in hobbies, or just read a good book. Here are four creative She Shed ideas to inspire your own She Shed plans. This YouTube video illustrates how a little paint, decorative furniture, and a few well-placed lantern lights can turn a boring shed or pre-fab building into a relaxing yoga or meditation room. Be sure you have enough room to stretch out your body comfortably without running into walls. Yoga or meditation spaces work best when they are open and inviting. If you do opt to furnish your space, choose smaller pieces that are easy to move if needed. When purchasing your shed or building, be sure to ask about adding extra windows or skylights that bring more natural light into your space. White or light-colored walls or flooring give your space a clean, tranquil look that promotes relaxation and rejuvenation. 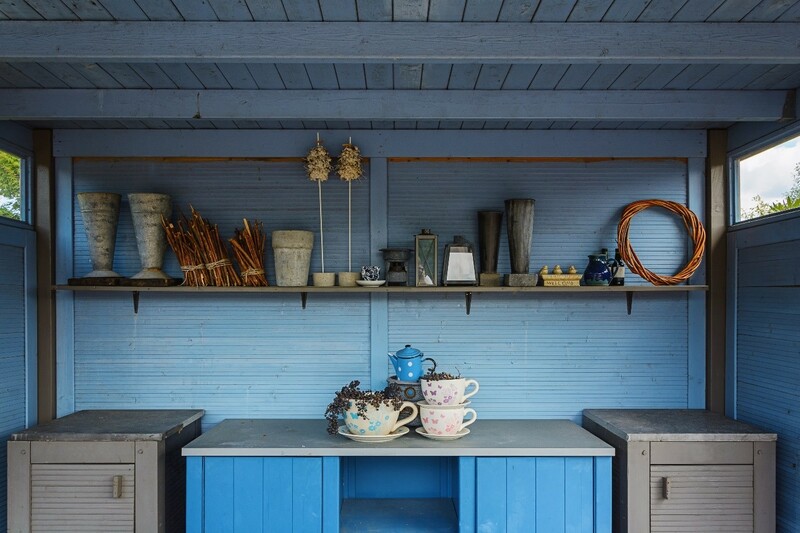 If you’ve been dying to let your creative muse out to play, turning your She Shed into an art or painting studio could be the perfect option for you. No more worrying about paint spatter on the floor or a bit of spilled glue. Your own art retreat is the perfect place to get messy and explore. When creating art, plenty of natural light is essential, so consider adding a skylight or extra windows to your shed to let the sun shine in. Whether you are painting, drawing, or crafting, art supplies tend to multiply quickly. Be sure to add plenty of shelving and hooks to keep frequently used supplies close at hand. Also consider adding a built-in loft for extra storage space for supplies and equipment. Carefully consider how you will use the space and measure your easel, work table, or other furniture before you buy. If you aren’t sure, err on the side of more space rather than less. You never know where your creative hobbies will take you next. If you love to sew or quilt, why not turn your She Shed into your own private sewing sanctuary? No more interruptions and you can even listen to the music you find most inspiring without disturbing your family. You’ll need a work table that can easily accommodate your sewing machine and the length of fabric you typically use. If you knit or do embroidery, you might also want a comfortable chair with a bright lamp to provide comfort and plenty of light for small details. 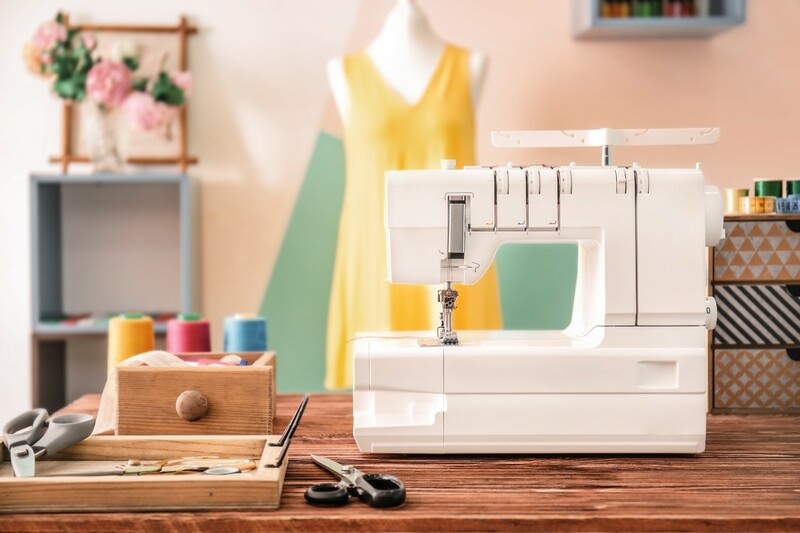 Don’t forget to plan storage space for large supplies like bolts of fabric, along with smaller items like pins, buttons, needles, scissors, and an endless array of accessories. Maximize wall space with mountable drawers that keep small items organized and easily accessible. Consider loft storage or cabinetry for larger supplies. If natural light is important to your work, be sure to ask about upgrades for larger windows or a skylight to shine more light on your projects. Be sure to outfit your garden shed with a sturdy workbench at the proper height to make potting and re-potting easy on your back. You want a space that makes it easy to start new seedlings or work with large, potted plants with ease. If you use a wheelbarrow, tiller, or other larger equipment, make sure the doors you choose are the proper width to accommodate your equipment. You might also add a ramp to make moving garden equipment easier. Add a pegboard or hooks to your garden shed to keep frequently used garden tools organized and close at hand. Consider adding a loft or sturdy shelving to store extra potting soil, garden chemicals, a tiller, or other machinery. Ask about larger windows or skylight options to give your plants the light they need to thrive before they make it into the garden. While custom sheds and buildings are ideal, you can often save money on the shed or building you’re considering by ordering a kit instead. Pre-made She Shed kits come with everything you need to assemble your shed on your own or with the help of a local contractor. From adding a fresh coat of paint to hanging shelving, hooks, and other decorative touches, a little elbow grease can go a long way to bringing your She Shed design to life for less. When it comes to furniture and accessories make sure you check out local thrift stores, antique shops, flea markets, or craft fairs for unique finds that show off your personal style for less. No blog post on She Sheds would be complete without a nod to the humorous She Shed commercial from State Farm. While we’ll never know for sure what really caused the fire that led to the destruction of Cheryl’s She Shed, there are some things you can do to prevent your own She Shed disaster. While candles create a cozy, or even spiritual vibe in many She Sheds, be sure to place them on a solid surface where they aren’t likely to topple over. Don’t forget to extinguish them when you leave your She Shed. You might also opt for battery-operated candles that provide ambiance without the risk of fire. If you’re planning to add electricity in your She Shed, be sure to hire a licensed electrician. Proper grounding of electrical wires is very important to lower the risk of electric shock or potential fire hazards. Many types of paint or solvents typically used in arts and crafts are flammable. Be sure you have enough ventilation in your She Shed to use them safely, and follow the manufacturer’s instructions carefully. No matter how you plan to use your She Shed, Newmart Builders offers affordable prefabricated steel buildings with plenty of custom options to suit your style. We even offer She Shed kits you can assemble with a few helping hands and some DIY skills or with the assistance of a local contractor. Just imagine slipping away to your own private space where you can lock the door behind you… We’re here to help you make it happen!